One thing that you must keep in mind is that you cannot negotiate the amount you owe. What this means is that you cannot call your student loan lender and offer them $5,500 cash for a loan balance of $10,000. This may work with credit card companies but not with your student loans. In fact, you should not even waste your time trying this as it will not work. The amount you owe is the amount you owe. It will only continue to grow in number as the months and years pass, so it is time to do something about it. One of the benefits of having federal student loans is that you do have some flexibility if you cannot afford your monthly payment. Your federal student loan lender offers forbearance and deferment options for you to take advantage of. These options will allow you to stop paying for a short period of time. This will allow you to find employment and get back on your feet. Most deferment and forbearance options last for 12 months once you have been approved. However, you will need to reapply yearly so don’t miss the deadlines. In addition to forbearance and deferment options, you can apply for additional repayment programs including ones based on your income. These programs are beneficial for many students who can afford to pay something but can’t afford the entire amount. If you apply to the income-based repayment program, you are responsible for paying 15 percent of your discretionary income on this plan. Your discretionary income is considered anything above the 150% poverty line determined by the government. To facilitate this example, we will say that the poverty line income is $10,500 for a single, one-person household. You make $21,000 per year. To figure out how much you would pay, you will take the poverty level of $10,500 and multiply it by 150% to get $15,750. You will then take your $21,000 and subtract the $15,750 to arrive at $5,250, which is the number that the 15% will be factored on. You would end up paying $65.62 per month on this plan. If you fall behind on your student loan payment when you have a private student loan, you do not have as many flexible options as a federal student loan. One of the first things you can do is refinance your private student loan. You do have to have good credit to do so and you must be employed. If you cannot meet this criteria, you will need to have a cosigner that does meet the requirements. If you cannot refinance your student loans, you may want to try consolidating them and work out a different payment plan to lower the monthly payments. If you fall behind on your student loan payments, it is important to seek out help immediately instead of waiting until your credit score is ruined. Don’t be afraid and talk to your lender today. Questions: Did you have to take out student loans for college? Did you have any trouble paying them back? How did the student loan debt affect you in other ways? 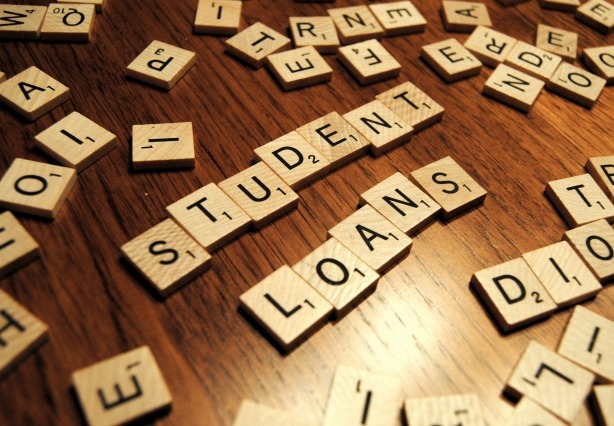 What tips can you offer for someone looking to speed up their student loan repayment plan? I am just glad that I got scholarship so I don’t have to deal with student loan. One colleague of mine worked part time when he was still in college to lessen the student loan she’d get. I had scholarships too but it wasn’t enough. Fortunately, I didn’t have a lot of student loan debt to pay back and got it taken care of. Can’t imagine having to pay over 100k back for school. But many people find themselves there and end up in a terrible financial mess for years. These are really good points. Paying off student loans is definitely a big expense to take on, especially at such a young age. With the right financial plan and guidance, though, it can be done! It’s important to thoroughly assess all of your options, as you note here. Very nicely said! Thanks so much for your insight!